Last week while strolling around the frou-frou shops at the recently developed Yacht Haven Grande, where you can pick up that Louis Vuitton hand bag you've always wanted, Beta Wife and I came across a few interesting restaurants located on the waterfront. W!kked, Grande Cru, and the Fat Turtle all fall under the same ownership and are overseen by the same chef Brian Katz), though each has its own distinct atmosphere attempting to appeal to a certain demographic. 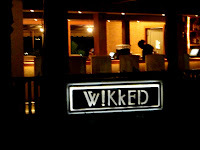 After checking out their websites, I formed this opinion in a nutshell: W!kked = young hipsters; Grande Cru = local yacht club; Fat Turtle = MTV springbreak! From a distance I admit these places didn’t seem like they would be worth the time or money, but after looking at a few menus I decided that W!kked’s food sounded appealing and their menu was reasonably priced. On our first visit we went for lunch, where they seemed to get a local business crowd, light on the tourists. I had already looked at their menu and knew without a doubt I was going for the Cuban sandwich. Beta Wife and I split the sandwich with chips and salsa and an order of their wings, the "Rum and Coke" flavor which were sweet and mild. They came with a tangy dipping sauce (cumin, lime, tahini, chilis) rather than the traditional blue cheese that accompanies wings. 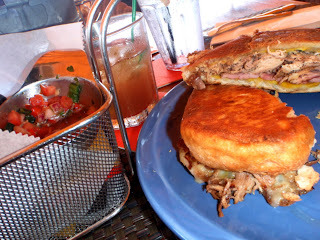 Everything was fantastic, but the Cuban sandwich was without a doubt our favorite. 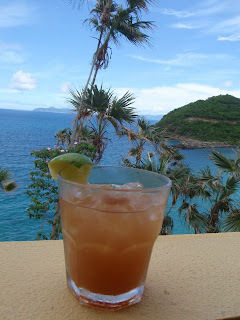 We also ordered a drink from their cocktail menu called The Wander that had coconut rum, tamarind, and fresh lime. I liked the drink enough that I attempted to recreate it at home and I’d like to think I came pretty darn close. Put all ingredients in a double rocks glass filled with ice, toss or mix well. If needed, add more rum. It's not that pretty, but it sure tastes good. 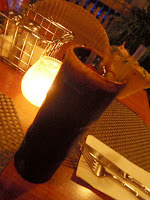 The tamarind concentrate seems to be the key to this drink because it has such a distinct texture. The splash of water is for diluting it so it’s not so heavy in the drink. I used Bello brand concentrate that I found at Cost U Less, but so far I can’t seem to find it online anywhere. Guess I’ll be stocking the suitcase. 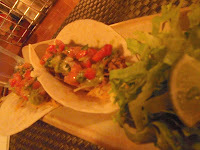 On our second visit we had intended to catch happy hour on Friday (5-7pm) and get some cheap jerk chicken tacos. We received a recommendation for Grande Cru’s happy hour (4-6pm) so I thought we’d hit them both. We stayed so long at the Grande Cru bar that we didn’t make in time for the other specials (I have a lot to say about their bar after I do a little more “research” tomorrow). However, we ate dinner at W!kked anyway—after all, it is just next door, and after a few drinks I had a severe craving for that Cuban sandwich. We split an order of pork tacos that were an unexpected favorite this time, stuffed with guacamole, cheese, and salsa, and we also tried the black beans, which complimented the tacos nicely. Slightly disappointing was the Roots, Rocks and Rum, their house rum punch—kind of watered down, no flavor, no real character except for tikki glass it came in, which was the real reason I ordered it anyway. Overall--the bar was ok, but the food was excellent. It’s worth it to wait for a seat outside if you’re dining in the evening, where you have a full view of the marina and all those pretty blue lights. Unfortunately we found out that night that they’re closing for three weeks, so there will be no more Cuban sandwiches for us this time. If you really can’t stand those pesky cruise ship types, avoid them.